A digital campaign to raise money and support for a healthy planet and happy families. Relays are usually about medals and trophies. This one’s about something much bigger. From May 3 to June 16, parents, community leaders, experts and even celebrities will share their personal stories on what they wish were true for every family, everywhere. Then they pass the baton to you. Every time you like, tweet, comment or share a post on social media, Johnson & Johnson will donate $1 – up to $500,000 – to five causes that help improve the health and wellbeing of families worldwide: Shot@Life, Girl Up, UNFPA, U.S. Fund for UNICEF, and Nothing But Nets. 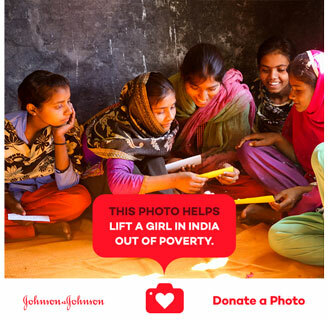 Use the Donate A Photo app and Johnson & Johnson will also donate $1 when you upload a photo for each of the five causes. Make a difference in seconds, with the click of a mouse or snap of your smart phone. Athlete, artist, wife, mother, philanthropist—in each of these things Kristi Yamaguchi embodies the word champion. Her motto is “Always Dream,” and Kristi’s accomplishments prove that dreams can come true with hard work and dedication. Her achievements—on the ice, in her personal life and in the realm of community service—are many, all of which prove her consistent commitment to excellence. With Mother’s Day upon us, it’s hard not to think of other moms and other families. Whether it’s a solid roof over their head, clean water, or medications on hand, I hope that they have the opportunity to raise a healthy family like we have. As a mom, you want to do everything you can to provide for your children and give them opportunities. Born in Iraq, raised in Jordan, and educated in England, Zain Habboo now calls Washington, D.C., home. As the Senior Director for Digital and Multimedia Strategy at the United Nations Foundation, Zain develops and oversees digital, video, photo, and mobile strategy for the Foundation and its 17-plus worldwide campaigns and initiatives. Her team's ambitious mission—to engage citizens around the globe with the lifesaving work of the United Nations—has resulted in the creation of viral memes (the #unselfie, #giveagif and more) and social media innovations (#Instacorps), as well as a leadership position in groundbreaking convergences such as the Social Good Summit, and much more. As parents, we are the best advocates our children have. Worldwide, we need to take every step possible to protect them—vaccinate them against illnesses like polio and measles, take them for regular medical checkups, feed them healthy foods. These are life-saving basics. Amelia was recently named one of the 2017 50 Most Influential Women by the Mecklenburg Times. She serves as Shot@Life Champion, a Visit.org Ambassador, a ONE Volunteer, and is a strong supporter of Cancer for College. She is currently a member of the International Food Wine and Travel Writers Association, Travel Bloggers Influencer Network, and the International Travel Writers Alliance. I traveled to Zambia with the United Nations Foundation’s Shot@Life team with a goal: to see the work being done to provide locals with immunizations and other healthcare. The results were clear – mothers of the community are the driving force. It’s an honor to take care of patients, and they help me be a better, more effective advocate. I want the same thing that any parent would: for all families to thrive. Zoe Saldana is an actor, mother and Global Advocate for the United Nations Foundation’s Shot@Life campaign. Zoe Saldana is the epitome of a true star in Hollywood, and has built her reputation as a versatile and respected actress by choosing roles that she feels passionately about. Saldana is currently in production in Marvel’s “Guardians of The Galaxy 2,” where she has reprised her critically acclaimed role of ‘Gamora.’ Saldana will once again star opposite Chris Pratt, Vin Diesel and Bradley Cooper. Recently, Saldana wrapped production on “Star Trek: Beyond,” the third installment to the 2009 blockbuster hit. Saldana will once again grace the silver screen as ‘Nyota Uhura’ opposite Chris Pine and Zachary Quinto. The J.J. Abrams’ action-packed film is slated for release in July 2016. Saldana has also taken part in The Haiti Relief Inc which works tirelessly to provide disaster relief to Haiti after the devastating earthquake in 2010. The organization focuses on distributing medical supplies, food, clothing and other necessary items (such as soap, chlorine bleach, etc.) to aid and assist the residents of Haiti. The organization also assists in rebuilding schools, medical clinics and hospitals being the focus of the organization from relief to development. Additionally, Saldana has participated development efforts with FINCA – an organization designed to alleviate poverty through lasting solutions to help build assets, create jobs and raise the standard of living. In 2010, Saldana spearheaded the “Lend a Hand” campaign – FINCA’s safe and easy to use online donation tool. The campaign allowed people to donate to FINCA and the women from around the world working to free their families from poverty to better the lives of their families. Saldana was born and raised in New York. When not on location, she resides in Los Angeles with her husband and twin boys. To be public figures, not only do we have the ability to entertain our audience and our followers, but we also have the ability to inform them on causes and organizations that need attention, encouragement and support. This is especially true when these organizations are providing aid and care for women and children around the world who don't have it accessible to them. Luz Towns-Miranda, Ph.D. received her doctorate in clinical psychology from NYU and was licensed in 1985. She received a postdoctoral certificate from NYU’s Postdoctoral Program in Psychoanalysis and Psychotherapy in 1998. Her varied experiences have included assessment and treatment of foster care children, running a therapeutic nursery, teaching family practice residents at Bronx Lebanon Hospital Center and Montefiore Medical Center. She has served on the NYS Board of Psychology since 2000. She presently consults with The Community Association of Progressive Dominicans, where she has been instrumental in the development of its mental health programs. She also consults to Acacia, a provider of mental health and substance abuse recovery services in the Bronx. She has been on the 18B panel in all five boroughs for over 20 years, conducting custody evaluations for the Family and Supreme courts. She is a member of the Trauma Specialization Certification Program Committee, NYU Postdoctoral Program of Psychoanalysis and Psychotherapy, teaching about the impact of trauma on children. Dr. Towns-Miranda serves on the national board of directors of Planned Parenthood Action Fund, the not-for-profit advocacy and nonpartisan political arm of Planned Parenthood Federation of America. She and her husband Luis A. Miranda Jr have been married for 39 years and have two adult children, Luz Miranda-Crespo and Lin-Manuel Miranda. They reside in the Manhattan neighborhood of Washington Heights/Inwood. Maternal health and mental healthcare are essential for mom AND baby. It’s the classic chicken or egg scenario: A mom with a community (partner, family, friends, medical) that supports her mental health will be able to create an environment for a baby to feel secure and happy. In addition to her extensive film and television credits, Dern has been prolific in her producing career with three upcoming projects for HBO including “Tiny Beautiful Things,” “Untitled Alex Gibney Project” and “Untitled Brownie Wise Project.” In 2016, she was also selected to serve on The Academy of Motion Pictures Arts and Sciences’ Board of Governors. Dern resides in Los Angeles with her two children. I wish that moms everywhere knew their own power. I wish that we could all understand that when we come together as women, as mothers, as families, as communities, we can make the difference. Jane M. Adams currently serves as Vice President, U.S. Federal Affairs at Johnson & Johnson (J&J). She joined J&J’s Washington, DC office in December 2003 as Senior Director, Medical Devices and Diagnostics. In her current position, Jane directs J&J’s federal affairs office in Washington, DC. Jane also staffs senior management on the AdvaMed Board of Directors and other industry trade associations and advocacy organizations. Jane is a member of the Medical Devices Group Operating Committee (GOC) comprised of J&J’s most senior global business leaders. Prior to joining the Johnson & Johnson office, Jane served as Director, Government Affairs for Medtronic, Inc. managing medical technology legislative advocacy and policy issues. Jane also previously directed government affairs efforts for the Juvenile Diabetes Research Foundation (JDRF) and continues to serve in several capacities for both the local and national JDRF. Jane directed congressional affairs for the National Association for Biomedical Research and worked in media and congressional relations for the National Cattlemen’s Association following an internship with the Senate Agriculture Committee. Jane received her undergraduate degree in political science from the University of Vermont and her Masters degree in Public Policy from Georgetown University where she serves as a guest lecturer throughout the academic year. She is a member of the Washington Caucus, the Government Relations Leadership Forum, and a founding member of RightNow, a professional women’s organization dedicated to electing Republican women into public office. Jane also serves on the Greater Washington Board of Directors for ChildHelp, a national organization dedicated to preventing child abuse. Jane was featured on the cover of Influence Magazine in 2004 as one of Washington's most effective corporate lobbyists. She and her husband Scott have a son Sam and a daughter Abigail and reside in Arlington, Virginia. I wish for families everywhere that children and family members have a safe and protected environment and a healthy place to live. The more that our children feel safe and protected and empowered to be who they are, and care about their own health and their own well-being, then they'll be the best contributors to society. They’ll help support a healthy planet, thriving society and compassion and kindness for others. Jeffrey came to UNFPA as a Media Specialist for sexual and reproductive health in January 2017. Before joining UNFPA, he was Chief of Communications with UNICEF Iraq. He has held posts with WHO, UNICEF and other international NGOs and has worked in over 30 countries in communications, health, protection and education. Prudence Chaiban, Information Management Specialist, Humanitarian and Fragile Contexts Branch, UNFPA HQ Prudence has been with the UNFPA Programme Division/HFCB for a few years, after working in a variety of positions abroad. Her most recent position prior to UNFPA was with the World Food Programme, where she served in several capacities in Sudan and Ethiopia. Being pregnant during a disaster can turn a difficult situation into a nightmare. To meet the maternal health needs of pregnant women, UNFPA initiated the Safe Birth Even Here campaign in 2012, which was relaunched in 2016. This program works in areas of crisis and conflict where health services such as antenatal care and skilled birth attendants can be hard to come by. My main hope for girls is that they are treated with the same love and respect and kindness and dignity that every human should get, no matter whether they’re old, young, boy, girl whatever they want to label themselves as! We wish that families had sufficient food and water because we know how many families are out there who are starving. We know that parents out there want to be able to provide for their children and give them a healthy life and they cannot do that without the necessities like food and water. I know how much my family means to me and how much my parents want to provide a good life for me and that's always built on basic necessities. Everyone deserves those basic necessities. Missouri native Katherine McNamara is an up-and-coming young starlet who can currently be seen starring as the lead ‘Clary Fray’ in the brand new Freeform series “Shadowhunters,” (January 2016); a book-to-screen adaptation of the bestselling “The Mortal Instruments” book series. News of her casting traveled fast and wide, including Deadline, Variety, The Hollywood Reporter, and The Wrap, to name a few. The series premiered to stellar ratings, being the #1 series debut in more than two years, and helped launch the rebrand of the channel alongside fan favorite “Pretty Little Liars.” In 2015, McNamara closed out a lightning year, portraying another fierce female role as ‘Sonya’ in the second installment of “The Maze Runner” trilogy, “Maze Runner: The Scorch Trials” alongside Dylan O’Brien and Kaya Scodelario. McNamara began her career on Broadway at the age of 13 as ‘Fredrika’ in “A Little Night Music,” starring opposite Catherine Zeta­-Jones and Angela Lansbury. Her other roles include ‘Esther Jane’ in the pre-­Broadway world premiere of “A Christmas Story, the Musical!” as well as “To Kill a Mockingbird,” “The Crucible,” “Inherit the Wind” and “Galileo.” She has also been cast in a number of Equity workshops/readings, including “PAN” with Laura Osnes, which was created by the “In the Heights” creative team. Even though we’re all different, we’re all individual, we have different lives, different perspectives, jobs, relationships, ways of living, when we can remember to communicate with each other and to share our gifts, and our talents, and be accepting of the gifts and talents of others, that’s when the whole becomes greater than the sum of its parts. Elvira, Cecilia, Modesta and Susana son lideresas y mentoras del programa Abriendo Oportunidades dirigido por UNFPA apoyado por Girl Up en Guatemala. El objetivo del Abriendo Oportunidades es compartir temas y habilidades en las comunidades, como el auto-estima, la comunicación y la negociación, la salud sexual-reproductiva y los derechos de la mujer. Cada comunidad tiene un club y cada club tiene una lideresa que fue seleccionada por Population Council para recibir capacitaciones y replicar los temas con las niñas de su propia comunidad. Asimismo, cada lideresa tiene una mentora; con lo que se construyen redes sociales y de apoyo para cada club. Abriendo Oportunidades también ofrece pasantías de un año para mujeres jóvenes con instituciones sociales como DEMI (Defensoría de la Mujer Indígena), CICAM (Centro de Investigación, Capacitación y Apoyo a la Mujer), Child Aid y Ecofiltro. Elvira, Cecilia, Modesta and Susana are community leaders and mentors through the Abriendo Oportunidades program, led by UNFPA and supported by Girl Up in Guatemala. Abriendo Oportunidades is Population Council's program for young indigenous women ages of 8 to 17 in rural Guatemala. The objective of the program is to share important topics and skills, such as self-esteem building, reproductive health information and women's rights, through weekly girls' clubs within the community. Each club has a lideresa from the same community that is chosen by Population Council to receive trainings and serve as a leader and teacher for girls in her own community. Every lideresa has a mentor as well, creating a support network for the both the girls and their leaders in each club. The program also offers one year internships to young women with local social institutions such as DEMI, CICAM, Child Aid and Ecofiltro. Elvira, Cecilia, Modesta and Susana are community leaders and mentors through the Abriendo Oportunidades program, led by UNFPA and supported by Girl Up in Guatemala. They share their hopes and visions for families and girls in the Chisec, Alta Verapaz. Elvira, Cecilia, Modesta and Susana son lideresas y mentoras del programa Abriendo Oportunidades dirigido por UNFPA apoyado por Girl Up en Guatemala. Ellas comparten sus esperanzas por las familias y niñas en la comunidad Chisec, Alta Verapaz. Carli Lloyd is a two time Olympic Gold medalist, a FIFA Women’s World Cup Champion and a two time FIFA Player of the Year. The New Jersey native was named the Captain of the U.S. Women’s National Soccer team in 2016. Carli has been a Johnson & Johnson ambassador since 2016, promoting charitable initiatives like Donate a Photo and the #CareUnited Challenge. My hopes for girls around the world are to continue to have the confidence and to believe in themselves. I think women and girls all across the world are powerful, smart and can do a lot of good in this world. It’s all about having that self-belief, that confidence and really going after your goal. Since October 2014, kids like Atesha have been racking up steps with their UNICEF Kid Power Activity Bands to earn points that unlock funding UNICEF uses to deliver this critical treatment to every child who needs it. An energy-packed peanut paste that contains everything kids suffering from severe acute malnutrition (SAM) need to get better, it truly is a miracle food. Since its inception, the growing kids-helping-kids movement has contributed 6.4 million lifesaving food packets, enough to save more than 40,000 malnourished children. The impact on children and families can’t be measured. I knew that some children in other countries went hungry, but last year, when I learned that some kids don’t have the food or clean drinking water they need to survive, it made me sad. We have what we need, why shouldn’t they? My UNICEF Kid Power activity band, counts my steps then turns them into food packets for severely malnourished children. So now me and my grandma walk a lot together. We walk a little, then we run and then we skip. Jenna Hager is a contributing correspondent on NBC's Today show and an editor-at-large for Southern Living magazine. She is also the author of The New York Times best seller Ana's Story: A Journey of Hope, which she wrote after traveling to Latin America in 2006 as an intern with UNICEF. Ana's Story is based on the life of a 17-year-old single mother with HIV, who struggles to shield her child from the life she had of abuse and neglect. Hager remains involved with UNICEF and is the Founding Chair of UNICEF Next Generation, an initiative dedicated to motivating younger generations to help save and improve children’s lives around the world. Hager holds a bachelor's degree in English from the University of Texas at Austin. She is also co-author of two children’s books: Read All About It! and Our Great Big Backyard. Hager is the daughter of former U.S. President George W. Bush and First Lady Laura Bush. In 2008, she married Henry Hager and they now live in NYC with their daughters Margaret Laura "Mila" and Poppy Louise. As a Global Mom, I know all parents want the same thing—the chance for our children to lead happy, healthy and productive lives. I look forward to the day when all families can see their children grow up to reach their full potential. Southern Punjab has a much higher rate of women dying from complications around childbirth and pregnancy compared to the rest of the province. The division in which Kainat’s district falls also has the highest rate of infant and children under age 5 deaths in the whole province. The Lady Health Workers’ program is designed to change the situation. Kimberly Chandler is known as a philanthropist, writer, community activist, and ambassador. Her unique style, which caught the eye of Anna Wintour in 2012, led to features with Vogue, the NY Times Style section, and Women’s Wear Daily. It also opened the door to her becoming a contributor to style.com, an online home of fashion news, and Essence.com, where she provided an insider look to some of the largest charity, fashion and art show events in NYC. Kimberly also serves on the brain trust and as a writing contributor for Propel Women, a faith based non profit organization whose purpose is to empower and assists with helping to activate, connect, and equip women to fulfill their God given passion, potential and purpose. In 2013, she was a member of the producing team responsible for creating the Tony Award nominated play, “The Trip to Bountiful”, starring Cicely Tyson. As a graduate from Columbia College Chicago, with a degree in journalism, she has combined her passions of fashion and writing with the need to raise social awareness. After each child is put down, the parents can retreat to their own warm beds, knowing they can rest peacefully because their children are secure and safe, and dreaming restfully, as every child should. This is what I wish were true for every family everywhere. Lauren Bush Lauren is the Founder and CEO of FEED, a social business whose mission is to "Create good products that help FEED the world." After traveling around the world with the UN World Food Programme as a student, Lauren was inspired to create a consumer product that would engage people in the seemingly overwhelming fight to end world hunger. In 2007, FEED was founded with every product sold having a measurable donation attached to it. To date, the social business has been able to provide over 90 million meals globally through the WFP and Feeding America. Lauren lives in NYC where she works on FEED and other socially conscious business ventures, she is also a Founding member of UNICEF Next Generation. There are plenty of things that come to mind in response to this question – health, happiness, equality, opportunity, love, time – but my gut reaction, and the reason I started FEED, is the most basic need of all: Food. What I wish were true for all families, everywhere, is that hunger and malnourishment would be far from reality. Serbian tennis star, Novak Djokovic, is considered one of the greatest tennis players of all time. To date, Djokovic has won a total of 66 career titles, including 12 Grand Slams, five ATP tour finals, Davis Cup title, and he was a Medalist at the 2008 Summer Olympics in Beijing. He was appointed UNICEF Goodwill Ambassador with a special focus on the issues of vulnerable children and their communities in August 2015. His unquestionable commitment to philanthropy is evident through the work of the Novak Djokovic Foundation, a global organization that champions and invests in early childhood education and development, both in Serbia and internationally, and his previous position as a UNICEF Serbia Ambassador. Novak Djokovic is a true champion for children around the world. He has proved that a powerful voice speaking on behalf of important, global initiatives can make a real difference to the lives of children from an early age. Fatherhood has changed who I am, my relationship with Stefan has made me want to help all children realise their dreams. Since making her film debut in John Singleton’s Oscar nominated film, “Boyz In The Hood,” Nia Long continues to cultivate a versatile resume in both film and television. She is best known for her roles in the television series “The Fresh Prince of Bel-Air” and “Third Watch,” and the films “In Too Deep,” “Friday,” “Boiler Room,” “Soul Food,” “Love Jones,” “The Best Man,” “Big Momma’s House,” and the sequels to the latter two films. Long currently appears in Warner Bros. comedy “Keanu” opposite Key & Peele, and will next be seen starring in the ABC comedy “Uncle Buck" opposite Mike Epps, premiering on June 14th. A Brooklyn native, Long resides in Los Angeles with her two sons and fiancée Ime Udoka, assistant coach for the San Antonio Spurs. In addition to her film and television work, Long’s passion lies in supporting her community. With family roots in Trinidad, she aims to be a liaison between the youth in the United States and those on the island. In 2013, Long was a vocal proponent to the Barack Obama reelection campaign and has remained active in supporting women’s rights, education and affordable healthcare. In November 2016, Long and fiancé Ime Udoka partnered with the United Nations Foundation “Nothing But Nets” campaign to bring protective bed nets to regions affected by Malaria. The minute you become a mother, your priorities shift. Your entire being is now dedicated to making sure your children are healthy, happy, and safe for the rest of their lives. As a mother of two boys, I’ve been plagued by the same anxieties and fears that every woman experiences once they become a parent – and you are changed forever because from this moment on, your priority is your children. On January 13, 2016, ESPN officially named Jessica Mendoza to the Sunday Night Baseball team as an analyst. The announcement was made after a historic 2015 for Mendoza, who became the first female analyst for a nationally televised MLB Postseason game on October 6, 2015: AL Wild Card Game on ESPN. A few months prior, she became the first female ESPN MLB game analyst during the August 24, 2015 edition of Monday Night Baseball. She appeared on several Sunday Night Baseball telecasts during the stretch run of the season. Her groundbreaking 2015 also included the accolade of becoming the first female analyst for a Men’s College World Series telecast. One of the most notable softball players in the last decade, Mendoza’s on-field experience has seamlessly translated to television. She joined ESPN in 2007 and in addition to her MLB contributions, she has served as an analyst and a reporter for the Men’s College World Series, the NCAA Women’s College World Series, and is also a sideline reporter for college football. She has also contributed content to espnW. A future of a healthier planet, to me, for our children, is when we’re more united. Our growth is in our knowledge. The more that we can open up our minds to more people and understanding everything. It doesn’t matter. I imagine that our future, to be healthier is when everybody, no matter who you are, is able to be more united and get along. Michiel Huisman is an actor, dad and Save the Children Celebrity Cabinet Member. I just visited the world's largest refugee camp, Bidi Bidi. I discovered that, of course, we all want the same thing for our families. We want our kids to be safe, we want them to be healthy, and we want to see them thrive. We want them to have access to good education. Kyle Larson is currently among the points leaders in the Monster Energy NASCAR Cup Series and qualified for the 2017 postseason after winning at Fontana. Larson also earned Sunoco Rookie of the Year honors in 2014 after winning the same award in the XFINITY Series in 2013. Larson has two career Monster Energy NASCAR Cup Series wins, seven career wins in the XFINITY Series and two career wins in the Camping World Truck Series. Often among the youngest of his peers to reach a milestone, whether it be his ascent to NASCAR, fatherhood, owning a home or becoming an entrepreneur, Kyle’s journeys are fast-paced. The shy kid with a dream from northern California can proudly serve as a role model for others chasing down their own dreams in a number of ways. Never taking himself or life too seriously, he keeps the mood around him light and his quick wit allows him to take things easy, as he approaches life with an extra dose of fun at every turn. As a new and young dad, there are many things Kyle wants to share with his son. Kyle and Owen are sure to quickly bond as he teaches him the trades of being a man, like how to change a tire or tune his engine. And while Kyle already possesses strong traits that are primed for fatherhood, there are many others he’s working to master before passing along to Owen. I wish every family out there could just have all the basic needs it takes to live, a safe place for kids to play, good healthcare and education. Amisa is an 11-year-old refugee living at Nyarugusu Refugee Camp in Tanzania – it is one of the world’s largest refugee camps, run by UNHCR and supported by more than 70 partner organizations. Malaria is the leading killer here, where Amisa lives with her mother and six siblings. Amisa first met the UN Foundation’s Nothing But Nets campaign in August 2016 when she became the subject of its first-ever virtual reality film, “[NothingButNets.net/UnderTheNet] Under the Net.” Struggling to survive each day, and with no protection from mosquitoes that carry malaria at night, anyone can experience Amisa’s life through her eyes in this 360-degree immersive film. Hope abounds as her family moves into a new home, gets treatment for malaria, and she and her siblings prepare to start school – none of which is possible without the life-saving protection of the bed nets you help to provide by supporting the Global Moms Relay. Last summer, Nothing But Nets visited the Nyarugusu Refugee Camp in northwestern Tanzania. There, they met Amisa Batenga, an 11-year-old refugee from the Democratic Republic of the Congo, who became the subject of their new virtual reality film, “Under the Net.” Viewers can experience life through Amisa’s life and witness her transition to a new home, new school, and to a health clinic where her youngest siblings are treated for malaria. The team also helped to hang bed nets in her home. Recently, our partners at the UN Refugee Agency (UNHCR) had a chance to check in on Amisa and were thrilled to find that she is staying healthy and thriving, thanks to the support you provide to Nothing But Nets. Use the app and for every photo you share, Johnson & Johnson donates $1 to a cause you want to help. Johnson & Johnson has curated a list of trusted causes, and you can donate a photo to one cause, once a day. Each cause will appear in the app until it reaches its goal, or the donation period ends. If the goal isn't reached, the cause will still get a minimum donation. 1 life-saving measles vaccine for a child in need. Expands the possibilities for women and young people to lead healthy and productive lives. Helps community health workers in Pakistan teach new mothers self and newborn care. Protects a child from malaria with a life-saving bed net for six months. We're kicking off the Global Moms Relay with Moms +SocialGood. Join us May 4th in New York or via Livestream for this one-day event dedicated to the power of families.